You control the frequency and types of posts by configuring your settings. This is the quick start guide for those of us that like to jump right in. Click "Social Media Manager" at the bottom of the drop down menu. You'll hook up your social networks, customize posts and set posting frequencies first. Activate any social networks you'd like to use with Social Media Manager. 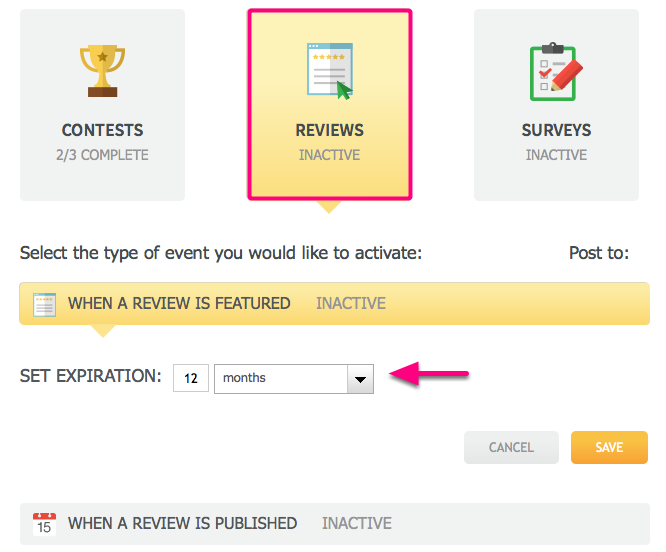 Customize Contests, Reviews, Surveys activity posts. Add Schedule Rules to determine when to post Contest announcements. Customize a Message for each Schedule Rule. Tell Social Media Manager when to expire a Review or Survey and thereby remove it from approved content in the Content Library. AutoPost intelligently posts your approved content for you based on the settings found here. ...and adjust the sliders to fine tune the different categories of content to post. Create your own voice! The Content Library is where you find, approve and schedule content for Social Media Manager to post on your behalf. PRH Provided - This is content is curated, categorized and made available by Patient Rewards Hub™. My Creations - This is content you have added to Social Media Manager. It can be a message, article, image or video link. Program Activities - This is content created by the three program activities: Contests, Reviews and Surveys. It's easy to find content in the Content Library. Social Media Manager can only post content you have approved. So we'll need to keep Social Media Manager happy by giving it lots of approved content. Hover over an article you like. Click "Approve" to approve it and let AutoPost figure out a good time to post it based on your settings. Or click "Schedule" to approve and pick an exact date and time you'd like to post it. You can also Auto-Approve new content from an entire category by ticking the checkbox in AutoPost settings. There are endless possibilities when you add your own content! Social Calendar lets you view what's been posted as well as make on-the-fly adjustments to your upcoming posts. We've set up Social Media Manager's settings to our liking and begun approving content.